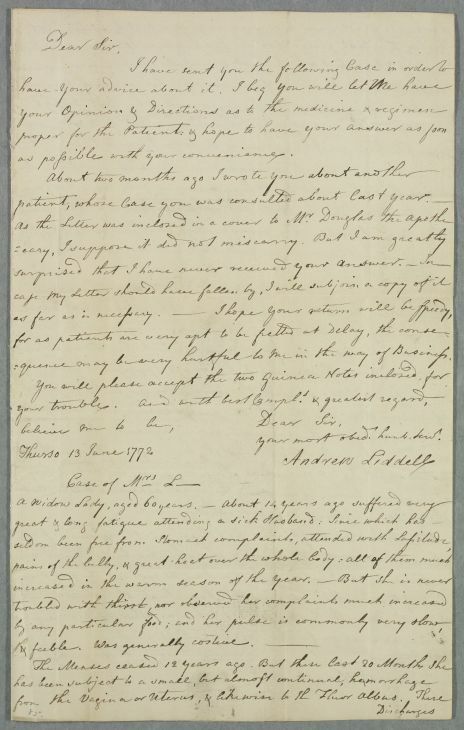 Letter from Andrew Liddell regarding the case of Mrs L, who 'suffered very great & long fatigue attending a sick Husband' some years ago, has 'seldom been free from Stomach complaints' since, and also has a vaginal discharge and a tumour in her breast. 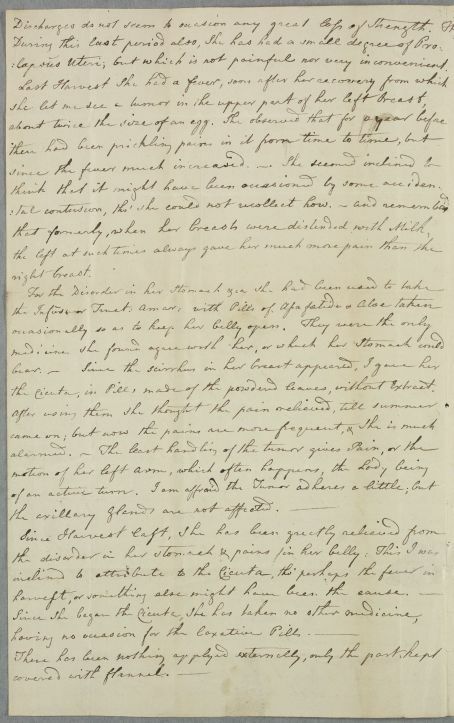 The letter also includes a copy of a letter sent to Cullen previously [by Thomas Scott, addressed to Liddell, ID:820] about an unnamed 'Lady from Orkney' with scrophulous complaints which was originally enclosed in a letter to Mr Douglas, the apothecary. 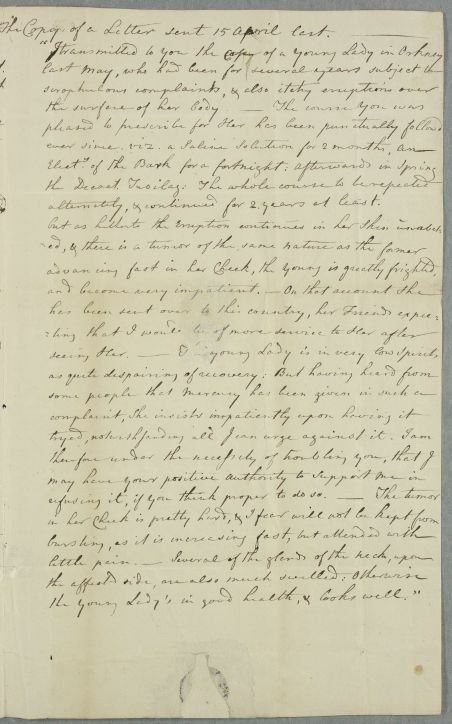 Summary Letter from Andrew Liddell regarding the case of Mrs L, who 'suffered very great & long fatigue attending a sick Husband' some years ago, has 'seldom been free from Stomach complaints' since, and also has a vaginal discharge and a tumour in her breast. 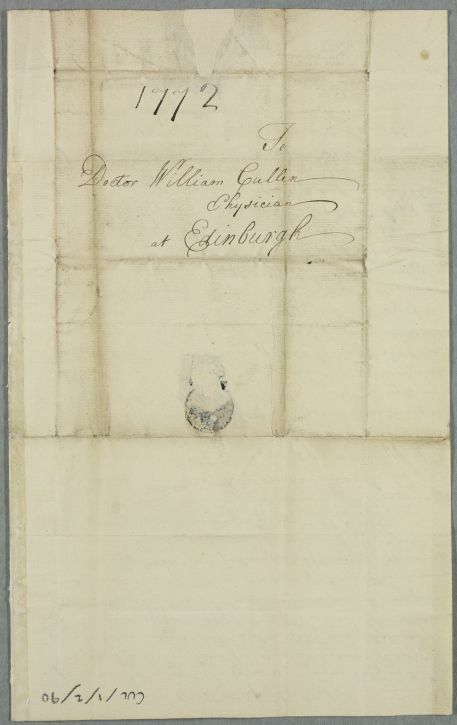 The letter also includes a copy of a letter sent to Cullen previously [by Thomas Scott, addressed to Liddell, ID:820] about an unnamed 'Lady from Orkney' with scrophulous complaints which was originally enclosed in a letter to Mr Douglas, the apothecary. Case of Mrs L, who 'suffered very great & long fatigue attending a sick Husband' some years ago, and has 'seldom been free from Stomach complaints' since; she also has a vaginal discharge and a tumour in her breast. Case of an unnamed female patient from Orkney, suffering from 'scrophulous complaints' for several years. Cullen had been giving advice on her treatment over the previous two years. as possible with your convenience. quence may be very hurtful to me in the way of Business. Discharges do not seem to occasion any great loss of Strength. lapsus Uteri; but which is not painful nor very inconvenient. the Cicuta, in Pill, made of the powderd leaves, without Extract. alternately, & continued for 2 years at least. the young Lady's in good health, & looks well."